Another week is gone, which means another week is here! As usual, there’s plenty to do around St. Pete. Start things off with a Thursday full of shuffleboard, a visit to the Royal Palm market, or the kickoff of the Power Boat and Sailboat Show. Continue things on Friday with a Glow Fashion Show or Downtown Comedy Night at Caddy’s on Central. Saturday includes the iconic Saturday Morning Market, as well as the Holiday Indie Market and the city’s annual Snowfest. Bring things to a close on Sunday with the final day of the boat show and a trip to the St. Pete Sunday Market. The holidays are here, so be sure to take advantage of the events that come with them! Enjoy! If you like 10% off your drinks and you like to drink organic, this is the perfect event for you! Starting at 8pm, check out discounts on organic beers, gluten free beers, organic wines, organic sangria, and organic prosecco. Now is the perfect time to show off your shuffleboard skills! 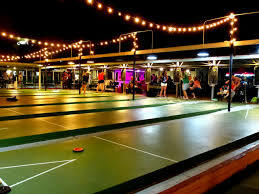 The St. Pete Chamber is hosting a tournament at the St. Pete Shuffleboard Club with registration starting at 3PM. Tutorial begins at 3:30PM and the tournament itself kicks off at 4. Registration is $100 per team (2 people) and Happy Hour tickets are also available for $25. Test your skills in the game and network with some of the biggest local organizations. To register and for the list of sponsors, visit here. The largest power and sailboat show on the Gulf Coast is sailing into St. Pete! Head to Albert Whitted Park to view an extraordinary selection of power boats and sailboats in water and on land. Shop a 40,000 square-foot tent housing all types of marine gear, and enjoy fun for the whole family all weekend long. Show-goers will be excited to find hundreds of power boats and sailboats including family cruisers, runabouts, fishing boats, magnificent sailing yachts, personal watercraft and so much more! Visit St. Pete’s Power & Sailboat Show’s website for more information. End your week on a good note with Yard of Ale from 8PM to 10PM! For just $10, you get access to an open bar with their signature CCB 1821 Golden Ale as well as wells and 360 Vodka. The bar is also hosting a holiday toy drive, so be sure to donate! For more on that, see https://www.facebook.com/events/777478469267260/. Join Caddy’s on Central for a night of laughs! See comedians Johnny B. and Steve Lazlow for laughter and fun. Guests must be 21 or over. The event is free, but seating is limited! The event goes from 9PM to midnight. Wrap up your busy week with blacklight fun at the Iberian Rooster! The event kicks off at 9PM with glowing fashion and drinks for a night of music and a fashion show. Tickets are $10 and can be purchased here. Hang out with Creative Loafing Tampa at St. Pete Shuffle for a variety of brunch bites from restaurants around the area from 12PM to 3PM! Enjoy complimentary shuffleboard and shop with local vendors while sipping mimosas. Tickets are $55 for VIP and $30 general admission and can be purchased here. The event is 21+. Shop small this year at this open air showcase of over 100 local and traveling makers, artists and creatives! 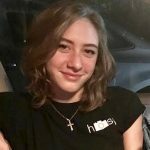 Handmade goods, plants, upcyled furniture, indie home design, vintage clothing, organic body care, prints and greeting cards, leather, coffee and more! The family and pet friendly fun goes down from 6-9 p.m. on Baum Ave, next to Green Bench Brewery in St. Pete. Join American Spirits for their annual Holiday Champagne show at Ruth’s Chris Steakhouse from 1PM-4PM. Visitors will taste over 20 champagnes and sparkling wines – with delicious hors d’oeuvres from Ruth’s Chris. Tickets are $80 and can be purchased here. 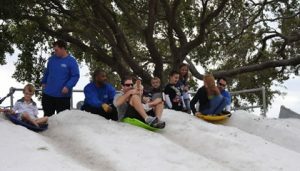 Sixty-five tons of snow are expected to fall in North Straub Park at the annual holiday Snowfest celebration. Join the fake snow fun from 10 a.m. until 3 p.m. Activities include a big and kiddie toboggan slide, art tent, karaoke, moonwalks, giant slide, “glice” ice skating, and a Kiddyland area designed especially for pre-schoolers with inflatable train, cookie decorating and more. Make your holidays bright with vintage delights! 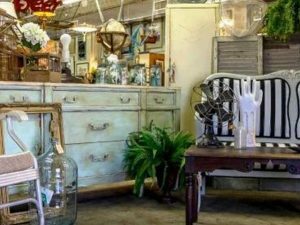 Explore 15,000 sq feet of vintage treasure finds at this monthly market in St. Pete! This true vendor-run market has an amazing variety and selection of vintage items unlike anywhere else. Grab your next vintage find the first weekend of each month from 9 a.m.-7 p.m. on Saturday and 9 a.m.-5 p.m. on Sunday at 2200 2nd Ave S in St. Pete.